Why are people drawn to Kirtan Singing? For the past years, an increase in the number of people that seem to be connecting with Kirtan can be observed in the US. What is it with Kirtan that gets people’s attention? Is it the chants and melodies used? Is it because it is offered at a favorite Yoga studio? Is it the novelty of the language, or passion for music?Is it because it is the latest trendy thing to do or is it because it leaves us totally relaxed and rejuvenated? Whatever be the reason, Kirtan singing connects people. It brings a community together and creates lifelong friendships, a safe haven for relaxing and sharing your chants, mantras and shlokas and a place where one can find their singing voice. The intent of Kirtan is to calm your mind from all the stress, worries and negative thoughts. Kirtan singing works well with most people because chanting engages our mind and it is a musical. The melody and the words (even if you don’t understand a thing) give us a soothing feeling that lifts our spirits. 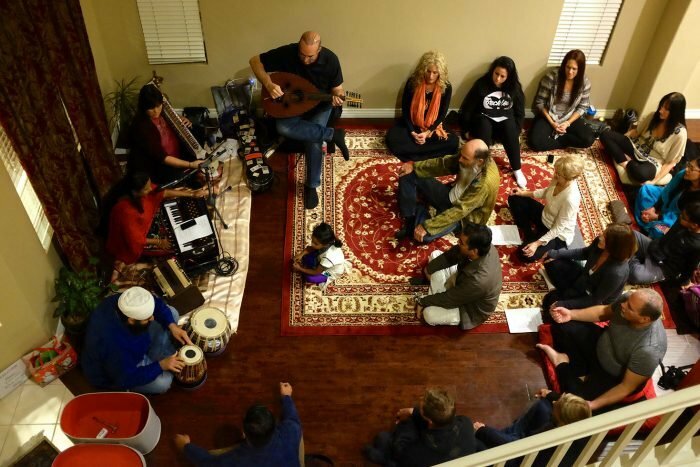 Typically in a Kirtan participants sit comfortably on cushions facing a group of Musicians and Kirtan leader. Depending on the Kirtan leader there could be a bunch of instrumentalists. Tabla drums, Guitar, Harmonium etc are traditionally used. Kirtan night could last about 2 hours and everybody is welcome regardless of race and religion. The participants may join or may opt to just listen and enjoy the buzz like feeling during the session. Kirtan singing is like community or group singing. People participate and respond back in Kirtan. One does not simply buy a ticket, sit down, and grab a beer like in regular concerts. Kirtan singing teaches us value of discipline and wellness. It teaches us to sing in unison and encourages us to be in sync with others. Often times participants clap or dance. Clapping to the beat and singing triggers release of endorphins and oxytocin, both of which are associated with the feeling of happiness. Kirtan music is processed by all areas of our brain and Kirtan singing has the ability to access and stimulate areas of the brain that may not be accessible through other modalities. In a group setting like Kirtan, each participant feels the musical vibrations moving through their body simultaneously. Our heart beats become synchronised. Couple of minutes of silence that follow a Kirtan draws us into our inner selves, giving us time to reflect, breath out any residual stress or worry. It is the feeling of calm and happiness that comes after Kirtan that draws people in. It is joy of sharing, warmth of a friendly hug, the chanting of Om, hearing to voices all around you and knowing that you are not going to be judged for how you sing, who you are or your thoughts, problems or anything at all that makes Kirtan singing so special.